Coming out as a jewelry artist — what does that mean? 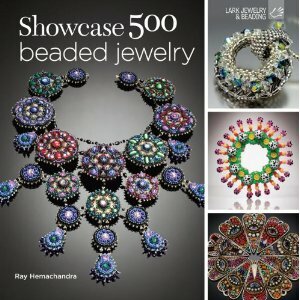 For those of you who see jewelry making and beading as something more than a hobby — something more defined by art and design — actually calling yourself a jewelry artist or designer, instead of merely alluding to it, is a big step. A very big step. It’s fraught with fear and dread. It means very visibly presenting yourself with a new public identity. It means preparing your ego to receive some negative comments, perhaps doubt or disbelief, and in some rarer instances, rejection or denial. It means asking others to accept and support you in your new role as Jewelry Artist and Designer. Please share what this process was all about for you. How you felt. How you managed things. Continuing with an article I had written…. There is some hesitation. “I am a jewelry designer.” Can’t quite get the words out. 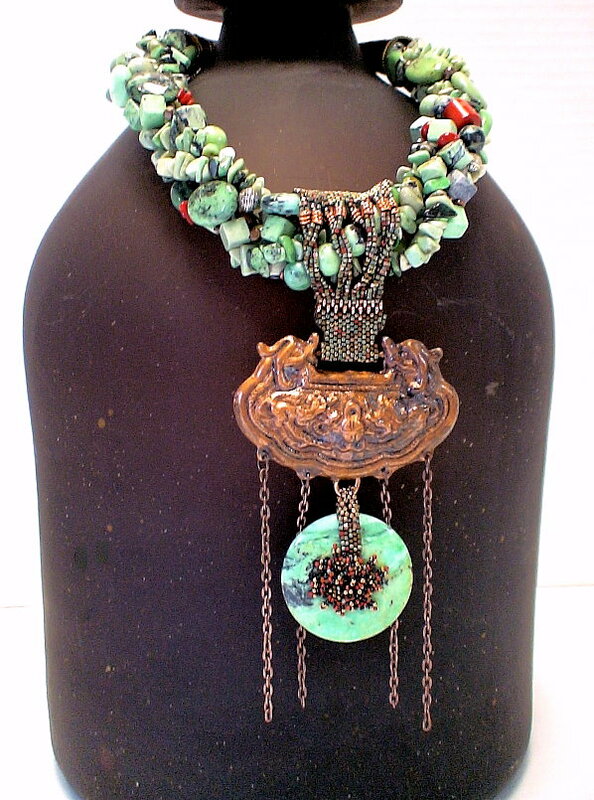 “I am a jewelry designer.” Keep wanting to say “but” or add some qualification, so other people don’t say, with mocking and astonishment, “You’re a what!#@?” “I am a jewelry designer.” You whisper to yourself over and over, but don’t tell anyone else. When you step out of the closet, however, you show others you want respect. As a jewelry designer. You demand from others an understanding. As a jewelry designer. As an artist. You present yourself as someone with self-esteem and confidence. As a jewelry designer. And as an artist. So what does it take to manage the transition before and after? What does it take to show that you can confront your passions for designing jewelry, not only privately, but publicly as well? 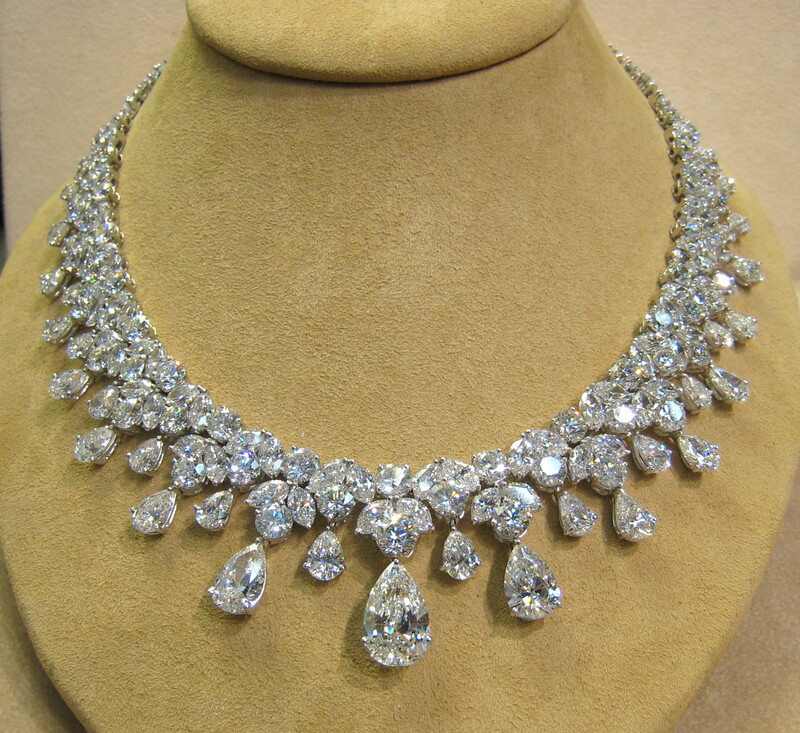 A necklace, or any type of jewelry, has a structure and anatomy. Each part has its own set of purposes, functions and aesthetics. Understanding each type of structure or physical part is important to the designer. Let’s focus on one part today – The Yoke. The Yoke is one section of the Strap which is the part around the back of the neck, including the Clasp Assembly. To what extent, during your design process, do you divide your necklace into its anatomical parts, in order to have more strategic control over its design? In an average necklace, how long should the Yoke be? What proportional length relative to the rest of the strap should this be? How do you determine the design and placement of beads or connectors along the Yoke, given that most of it would either not be particularly visible, or not often-visible when worn? The Yoke continues into the section of the Strap called the Frame. There are always transitional issues here? Do you have any strategies for managing these transitions? When your piece moves from Yoke to Frame, do you find yourself doing anything special at this point? Do you prefer your Yoke to be visually distinct from the Frame? Or more organically connected, perhaps not distinguished at all? Do you use any special visual cues to signal to the viewer that the piece is moving from Yoke to Frame – placement of special connector? Or change in bead size? Or change in Color? Or Pattern? How do you know where to place these visual cues? To what extent should the Yoke be integral to the design of the whole piece, or, on the other hand, be supplemental to the whole piece? Too often, when the designer does not recognize the Yoke as distinct from the Frame – even if the transition is to be very subtle – less-than-satisfying things happen. Proportions may be off. The piece may not lay or sit as envisioned. The strap may have too much embellishment going to high up the strap. Sometimes the balance between Yoke and Frame is off – too much Yoke and not enough Frame. So, what do you think? What do you do? What things can be done? Clasp Assembly: Part of the Yoke. 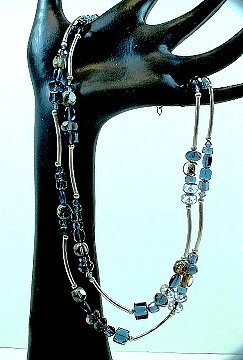 This includes all the pieces it takes, including a clasp, in order to attach your beadwork to your clasp. Break: Transition from Yoke to Frame, usually at the collar bone on either side of the neck. Frame: The “line” seen on the front of the wearer, demarcating a “silhouette,” and connecting to the Yoke on each side, at the Break. On a 16” necklace, this would typically be around 9-10” long. 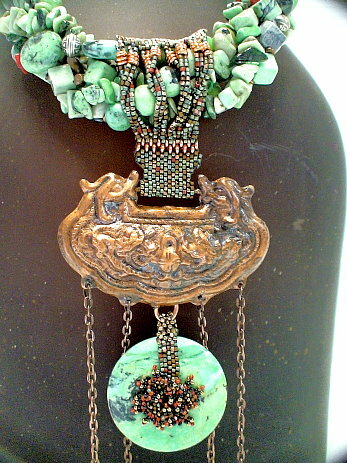 Bi-Furcated Frame: A Frame visually split in half, usually at the center and in two equal parts, with a centerpiece focal bead or pendant drop in the center. 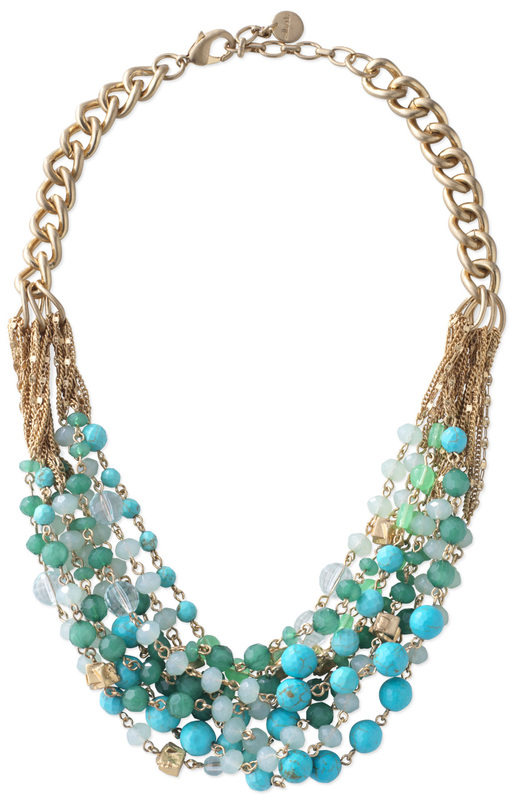 Focal Point: While not every necklace has a focal point, most do. The Focal Point gives the viewer’s eye a place to rest or focus. Sometimes this is done with a centerpiece pendant. 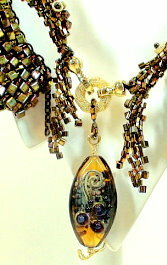 Can also be created by graduating the sizes of beads or playing with color or playing with fringe. Centerpiece: A part that extends beyond the line of the Frame, usually below it. Forces transitional concerns between it and the Frame. Centerpiece with Bail: A part that drops the Centerpiece below the Frame, forcing additional transitional concerns among Centerpiece, Bail and Frame. Strap: A word summarizing the full connectivity of the Clasp Assembly, Yoke and Frame. Canvas: Typically refers to the stringing materials. However, in a layered piece, may refer to any created “background” off of which or around which the main composition is built. Embellishment: Things like fringe, edging, surface decoration. – determining which parts or critical to understanding the piece of jewelry as art, and which parts are merely supplemental to the piece. Shopping in a bead store presents many overwhelming challenges — all the parts, all the colors, all the sizes, all the project possibilities. Many customers, when confronted with all these options, freeze up and get frustrated. 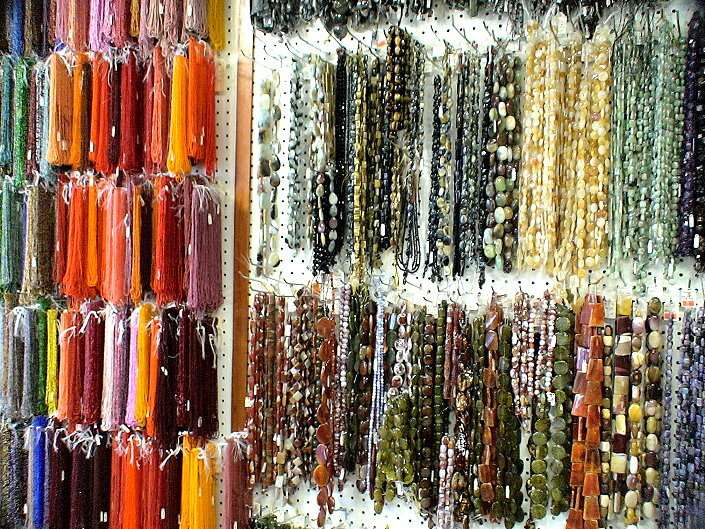 So, how SHOULD you shop, and how SHOULD YOU NOT shop in a bead store? Any interesting stories out there? 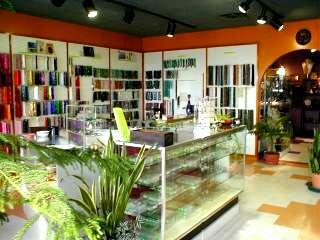 What was your first trip to a bead store like. To the consternation of staff, many a Bead Warrior, as they prepare to arrive at the field of bead-selection-battle, have not properly armed themselves. They arrive by car. They arrive by taxi. They arrive on foot. But rarely do they arrive with a design plan in hand. They arrive with ideas swimming in their heads, from magazine articles they’ve recently read, or advertisements they’ve seen, or dreams they’ve had. And it’s all in their heads. And when they arrive at the door, then cross the threshold, there are too many intimidating choices confronting them, attacking them from the right and the left and forward and behind, and off to the side, and down the aisle, and over and around the corner. The knitted scarf lady ready to conquer the bead world and find that blue bead for her fringe. But no yarn in hand. And there are so many blue beads. No sense of which blue will match. No sense of hole size. No idea what needle to use. Or how to get the beads on. Which “blue?” I asked, pointing to the 37 choices. Without a word, without any response to my question, she grabbed her purse and walked out. A woman had a list of 17 items she needed for a project. We had 16 of these items in stock. The one thing we didn’t have was one color of a delica bead. I suggested some good substitutions. 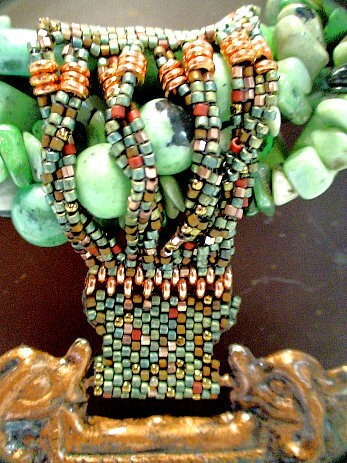 After all, there are almost 2000 colors of delica beads to choose from. She put all 16 items back, and walked out. The fashion icon determined to turn a brief visit to the bead store into ultimate world conquest, withOUT her recently perused copy of the latest of the latest from the best of the best style magazine. But no picture in hand. 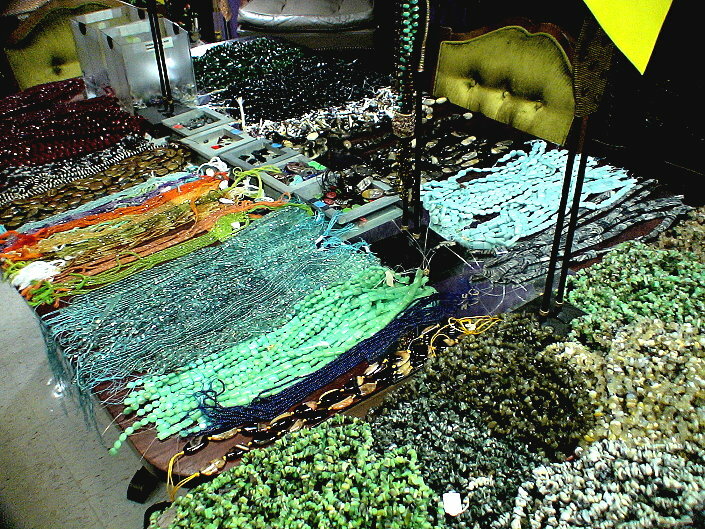 And there are so many beads and chains to choose from. No remembrance of what she had seen. No idea of how to attach things. No clue about finishing off the piece. The bead-weaver, knowing full well that success is just over that hill, a straight march, and that her right-angle-weave necklace will hup-two appear without much of a scuffle. Or tussle. Or hassle. Or, whatever else might get in her way. Yet no instructions. No supply list. No knowledge of stringing materials or tools. The woman in need of jewelry repairs. No jewelry with her. Wants that bead or rhinestone or clasp to make her jewelry complete. Which is at home. And she can’t remember. Doesn’t know sizes. Vague on colors. Forgets materials. Clueless on attachments. The woman who returns everything she doesn’t use – and then buys the same items for the next project which happens to use the same pieces. She frequently makes the 25-mile round trip to return even 1 bead not used. And then re-buys this very same bead on her very next trip on the very next week. The student who wants a bail for a pendant, has left that pendant at home, and doesn’t remember which direction the hole is drilled. The knowledge is all to be won – at the bead store. The field of battle. Shock and awe. Little preparation. Few soldiers. Few weapons. A daunting walk across the entrance, and that’s all it will take. To win. To accomplish. To finish. To conquer. The lesson, not to be lost here, is that you need to come prepared. Sufficiently armed. Some forethought. Some planning. Some thought-through concept. Some willingness to make compromises. The field of battle is very large. The opposing forces are onerous. Over 6,000 specifically named colors. 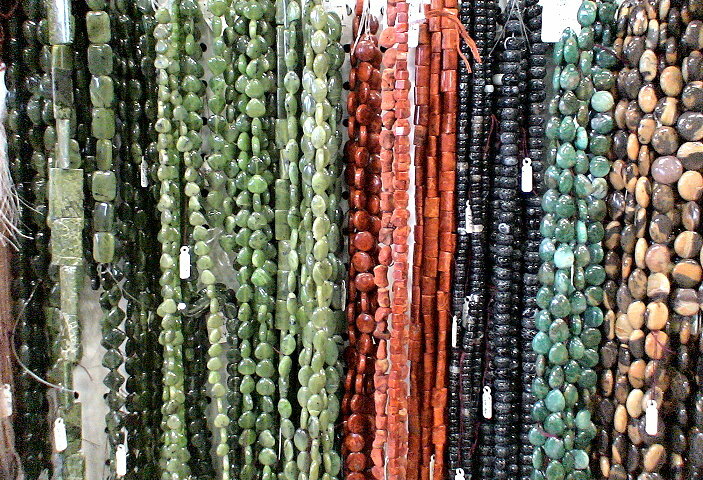 Thousands of styles and sizes and shapes of beads. Nearly 20,000 individually named metal parts. Fifteen different kinds of metals. Forty-two possibilities of metal finishes. Nearly 500 choices of stringing materials. Sixteen separate types of needles. Too numerous to count issues of quality and pricing. 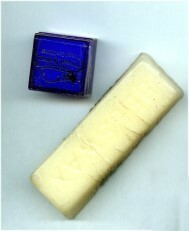 We are always debating here whether to wax your thread or not, and if so, what wax or thread conditioner to use. I have some strong opinions about this. Some people think it makes no difference as to whether the thread breaks. Some people think it ruins the beads. With beading thread, like Nymo or C-Lon, always wax. With cable threads, like FireLine, sometimes wax. I wax when the stitch I am doing is a loose one, like Ndebele or Right Angle Weave. The stickiness of the wax helps me maintain a tight thread tension. Never use pre-waxed thread like Silamide. Silamide is not abrasion-resistant, so it breaks too easily with beads. The holes of most beads are pretty sharp. Waxing keeps the beading thread from fraying. It’s stickiness allows greater control over managing thread tension. The process of waxing stretches the thread a bit before you use it. The waxy buildup helps fill in the jagged rim of the holes of your beads, making them a little less likely to cut into your stringing material. In our Jewelry Design Camp (www.warrenfeldjewelry.com/jewelrydesigncamp/), one of the topics we cover is the Bail. From a Design standpoint, it is not necessarily a simple jewelry finding to incorporate into our pieces. There are many types of bails, some off-the-shelf and some hand-made, and there are different ways of attaching them. A bail changes the visual and artistic relationship between the strap and the center piece. How might this be helpful, and how not? The bail poses similar design challenges as the strap — size, proportion, placement and attachment. However, it has to succeed at one additional task — it has to control the visual, aesthetic and functional transitioning between the center piece and the strap. It is the management of this transitioning which poses the most difficult design design dilemmas for the jewelry artist. Too often, I see people use a bail because it adds another pretty component to the piece. But it doesn’t necessarily fit. Sometimes it competes with the center piece or strap. Sometimes it creates a series of functioning or wearing or movement issues. (1) Do you use bails, and if so, do you have any favorite — either machine-made or hand-made? (2) Do you have good or bad design-experiences with bails that you would like to share with the group?